At the time of this posting, Zach doesn't know the corner stand will be replaced Christmas Day by a new desk—and matching computer! In keeping with his seaside motif, Zach selected the poster above his study desk. Zach's dresser is located next to the door, and above it are his karate and MMA (mixed martial arts) awards, with space pre-allocated for his two remaining color belts, red/black and black. And, yes, he is trying to learn guitar. 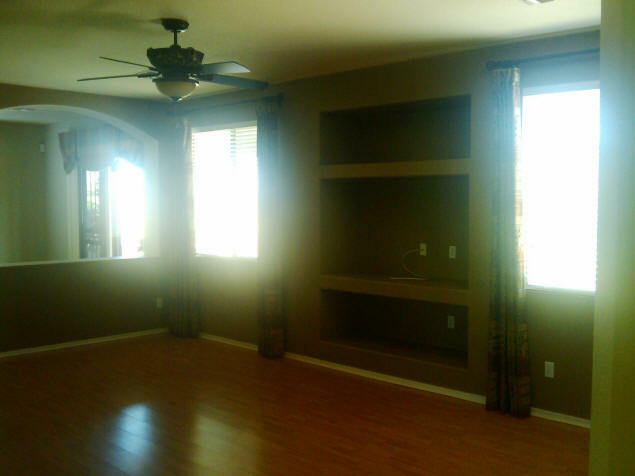 Although you can't see it in the photo below, Zach has a nice view of the Superstition Mountains from his window, as well as of the golf course that lies just behind the house. 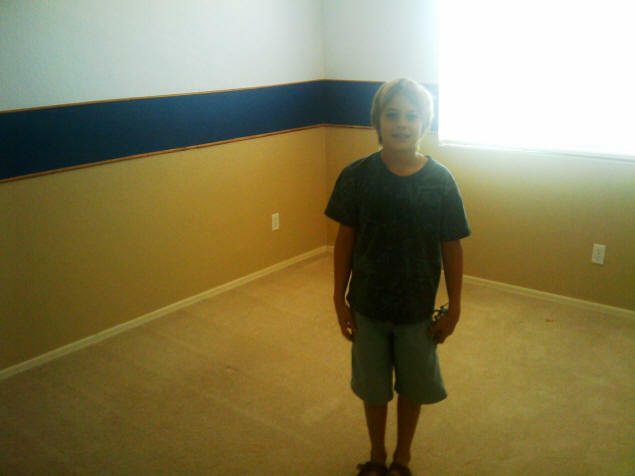 The day we took possession, Jenny took down the little girl window treatment (this had been Tommy's sister's room), painted the walls white, and added her own special touches to the wall. 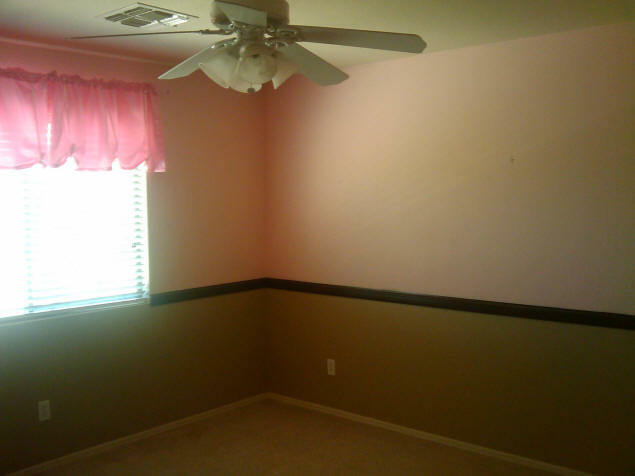 I'm sure the previous owners were wonderful people (they did take good care of their home) but some of their wall color choices left us baffled. 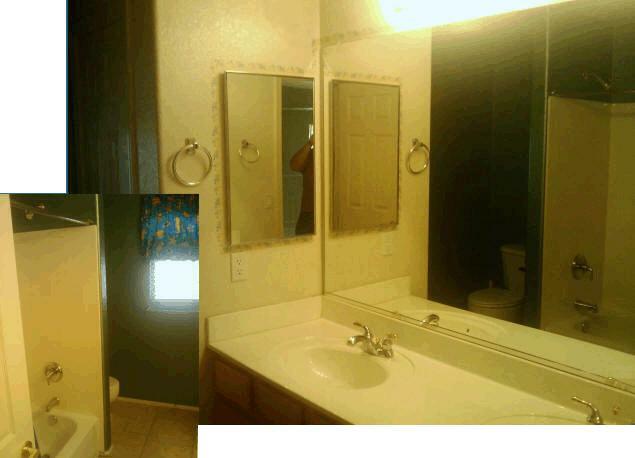 One was the iridescent blue they used in some of the upstairs bathroom. Since this bathroom would be used primarily by Jenny and Zach, she went right at it, lightening all the walls and installing a curtain between the toilet and tub areas so that they could both get ready for their day concurrently. 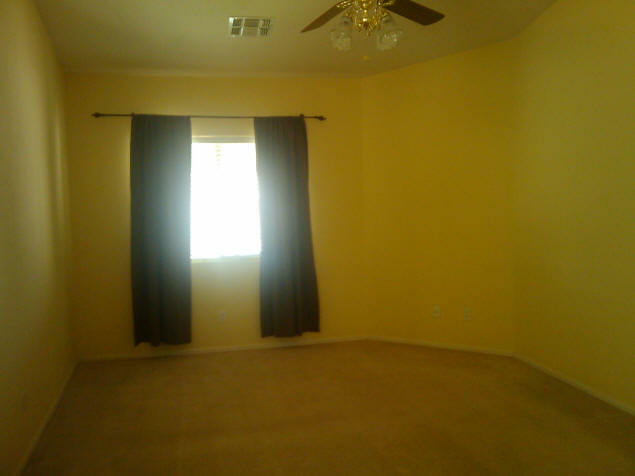 Our bedroom was another one that was a color that didn't work for either Michael or me, a shade of yellow. I chose three shades of taupe to replace it, a color I knew would complement both the winter and summer colors of bedclothes we already had. Please not, we plan on getting a new bedroom set in a few months so have not yet put up any pictures. That odd structure at the right of the photo is a cat climber that Zach and Jenny built. It's not as sturdy as they'd hoped and the cats don't like it, so it will be replaced soon. The love seat, which can certainly be used by humans (it's actually twin recliners), is more typically in use as a very expensive dog bed for Amber. By the way, the wall behind the love seat was originally dark brown. 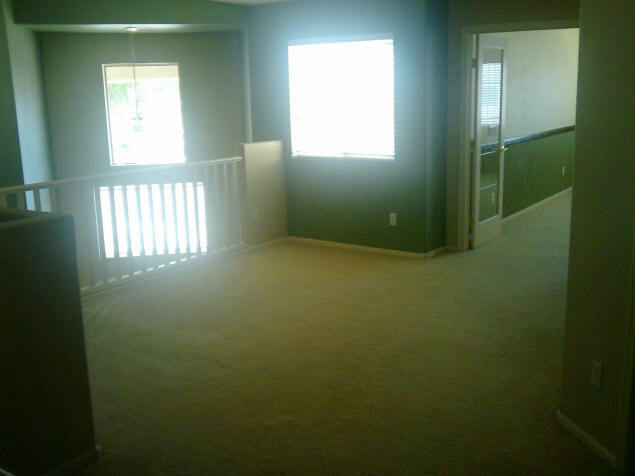 Making it a light green made the area look much less like an old castle and much more like a spacious home. And incidentally, I replaced the light bulbs in the sconces with LED bulbs, which use virtually no electricity at all; so we can keep them on all night at no measurable cost. The Family Room had been painted the same dark brown as the upstairs hall; and the built-in TV nook was designed for the big tube-type sets of the late 1990s. My son, John, took out the lower built-in shelf so the nook would accommodate our big-screen, HDTV; and we painted the walls two light shades of tan to allow an accent wall yet still open up the space. The rooms aren't all done yet, but I figure if I wait until everything's perfect there will never be any pictures at all! So, enjoy this work-in-progress; I'll post more as we get more rooms done.